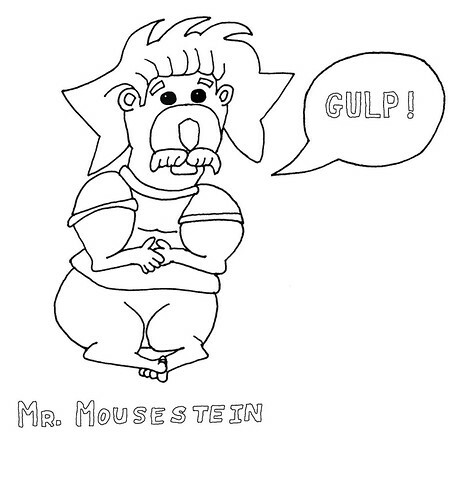 This is my seventh try at drawing a cartoon mouse, featuring a facsimile of Albert Einstein. I also want to write about the process I used, so others may comment on it, or perhaps even learn from it. I started with a blue pencil lead, sharpened and all, and drew a cute mouse figure, which is supposed to be a mouse-version of Albert Einstein. 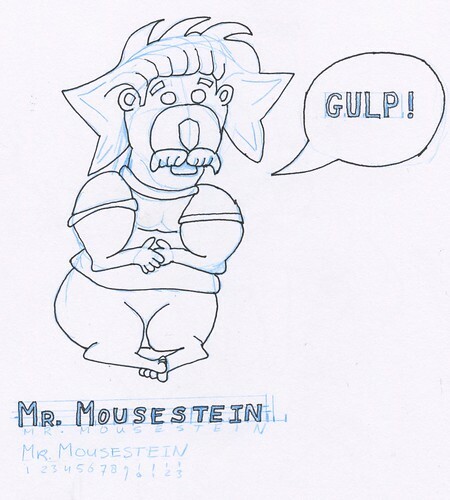 After I did that, I drew the Mr. Mousestein caption in blue pencil and inked the drawing with a rollerball pen by hand, using a magnifying glass for more accuracy. The letters were outlined with a fineliner. Because it looked so nice, I added the GULP! later, inside a speech bubble, first in blue pencil, next outlined with the rollerball pen and the fineliner. After scanning this inked sketch with the blue pencil lines into my Mac, I loaded it into GIMP, saved it as a new file (very important, because you never want to overwrite your original), and decomposed it into CMYK. I filled the C, M and Y layers with pure black and recomposed the image into the original (which is why you want to do this on a copy of your scanned file), so I was left with the black(ish) ink lines. Next was the clean up phase, where I selected everything white (30 % selection criterium) with the Select Color tool and pressing the Delete key (which turned everything selected into the background color if the image has no transparency to it). I inverted the selection, and filled the entire selection with pure black. The eyes and lettering was next on my agenda. I filled the eyes with black, by selecting the white inside the eyes, expanding the selection by one pixels and fill the entire selection with pure black. Next, I erased where I thought the highlights of the eyes would be. The lettering got a somewhat different treatment. I selected the white inside the characters, expanded the selection by one pixel, and filled with pure black. Then I reselected all characters, diminished the selection by 3 pixels, and erased the selection by hitting the Delete key. This left me with a nice 3 pixel outline for each character. The next part was finding the mistakes I made during inking and correcting those. For this final retouch, I selected the white, looked for parts that were supposed to be white, but not selected, zoomed in, and erased the pixels to the background color, reselecting the white, and repeated the process until all areas that were supposed to be white actually were white. Then I inverted the selection, and filled the entire selection with pure black, so I was left with a pure black or white drawing. I think if you want your drawings to have a professional look, you should spend this time on retouching your drawing before committing to it and save it as your final version of the cleaned up ink drawing. Now this image is ready for coloring. You may use it if you want, as long as you write you got it from me (linking to the photo on Flickr) when you publish it, and don’t make any money on it (Creative Commons, attribution, noncommercial). Now I need to study character design to learn how to refine your character without over-complicating it. In a strip or comic book you want to be able to draw your main characters with ease, and not reinvent the wheel for that character every time you draw it. I have done some animation using Anime Studio Pro, and I’ve learned from that experience that time spent in preparation is time well spent, and pays itself back manyfold when you go into production (like animation or a comic book).